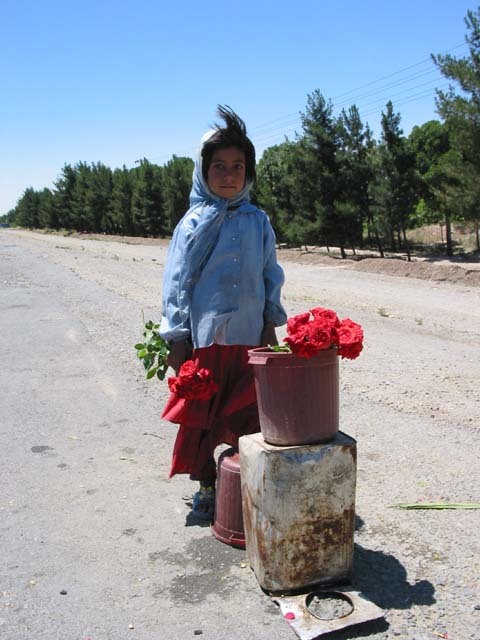 About a mile before the cemetery of Behesht-e-Zahra you begin to spot the flower sellers. Young men lined up by the sides of the road, holding out carnations and tuberoses as offerings for the dead. The gates of the cemetery, the main resting grounds for the martyrs of the Iran-Iraq war of the 1980s, are marked by red flags, the colour of tulips, commemorating the thousands who fought and died for their country. 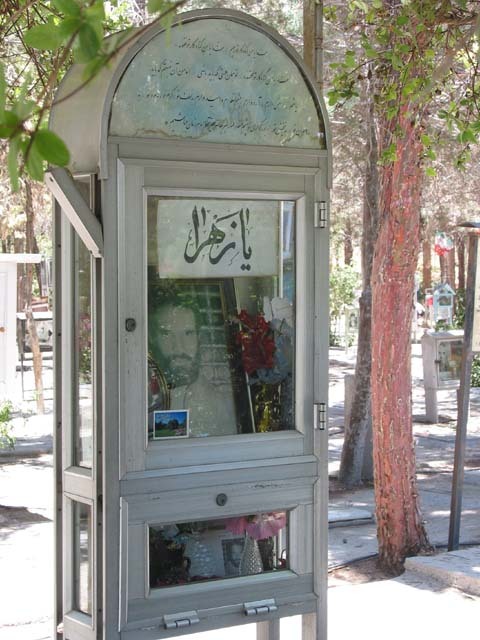 Two hundred thousand men were killed at the front, maimed by landmines and mustard gas dropped by Saddam's brigades; while the number of those disabled by the fighting is approximated at 1.5 million Iranians - the unofficial number of martyrs is whispered to be closer to three hundred thousand. A man selling Shia Nouhay mourning tapes and books by Ayatollah Behesti, the assassinated founder of the Islamic Republic Party, told me that landmines planted by the Iraqi army have yet to be cleared and even today they bury men killed by the after effects of the war, and so the number of Shaheeds keeps rising and there is little respite from grief at Behesht-e-Zahra. The graves are marked by elevated steel and glass boxes that contain photographs of the dead. Personal belongings - an old watch, personal letters, a comb - and flowers are propped up against the photographs of the many men killed during the eight years of war. Tombstones, sometimes covering empty graves in cases when the body of the Shaheed is still missing, mark the date and location of the men's death. Masoud Safarlou has no date of death on his tombstone; his body was found in a town called Faiyazi near the Iran-Iraq border; that is all his family knows. When years are provided, the effect is even more disturbing. Hamid Reza Saiyid was 15 years old when he was killed in 1981. His black and white smiling photograph sits in the glass box above his grave. He has no facial hair in the picture; he was barely even a man. Hamid Reza Saiyid was a boy when he was martyred. Another Shaheed was 17 years old at the time of his death in Boustan, one of the first towns that were directly attacked by the Iraqi Army. Another was 21; he had just completed his military service and was killed on his very first tour of duty. Some of the graves bore photocopied posters asking for the martyr's families to come forward and share their history in an official fashion so that their memory remains alive. As I walked along the rows of graves a woman in a brown chador offered me a plate of Halwa. "'No one goes hungry in Iran', that was the saying of the Revolution" explained my interpreter Samira. "The mourners at Behesht-e-Zahra will always be fed." We took a spoonful and thanked the woman for her kindness. Samira told me of the thousands of Iranian soldiers who had disappeared after the war. Three of her father's cousins, young men in their late teens, had volunteered and gone out to fight. Two of them never returned, they were killed. Their family had been told that the third son had also been killed, and though his body hadn't been found, he was given a funeral and a plot in Behesht-e-Zahra. Seven years after the news of his death, he returned home as a prisoner of war. He was alive. He now lives near south of Iran. Those men were not conscripted nor forced into the army due to poverty, they volunteered. "My father, who went to business school in London, also volunteered" shared Samira. "He was at the front for two to three years, he chose to be there. That is why America will not attack Iran today." 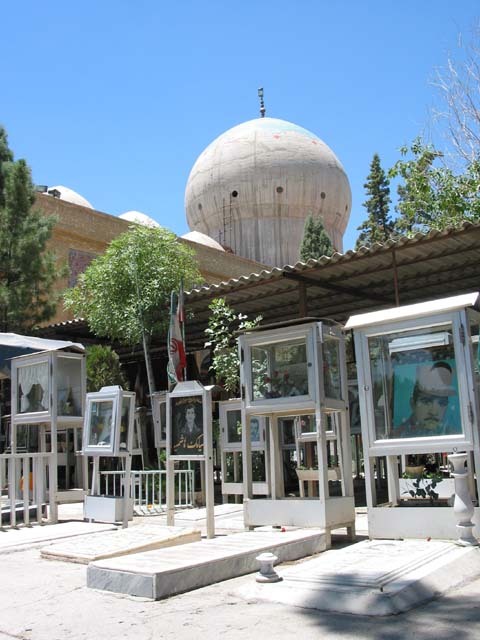 Behesht-e-Zahra also bears the bodies of those who died fighting against the Shah during the build-up to the revolution in 1979. The red, white, and green of the Iranian flag are hoisted onto the boxes bearing their photographs. The tombstones in this area are simpler than those of the war Shaheeds. Some are afforded black marble slabs, but most of the dead have their obituaries written on blocks of simple granite, the lettering of their names slowly fading with time. As we walked carefully between the graves, with little place to tread, a man and his daughter kneeled down by a family member's tombstone. The father took out a handkerchief and cleaned away the dust from the marble with water while his daughter placed fresh flowers in the glass box by a picture of a handsome young man in a white jacket. I said a silent prayer for the generation of children buried before me and we continued on our way. 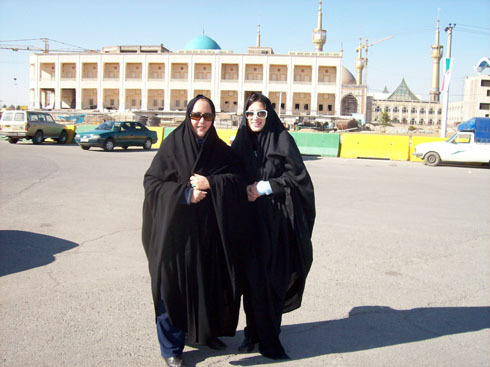 It was Friday and we followed the road between Tehran and Qom to visit the holy shrine of Imam Khomeini and witness the day's prayers. The mausoleum where the Revolution's spiritual leader is buried is surrounded by, of all things, a small shopping centre. Stores selling nuts, candy, toys and jewellery dotted the landscape and as Samira and I struggled with our full length black chadors we passed by families stocking up on food and refreshments. The domes of turquoise blue and gold, tiled with 72 tulips, one for each of the 72 people who were attacked with Imam Hossein in Karbala, are surrounded with scaffolds. Heavy construction was underway and we tiptoed gingerly over rocks and wooden planks, passing by an Afghan man and his parrot calling out to those who wanted their fortunes read. Once we removed our shoes we were directed to a security checkpoint where our bags (mine is gargantuan) were placed through an x-ray machine. My set of keys (also gargantuan) rang the alarm and we hurriedly reassured the security woman that my bag and I meant no harm so that we would not miss the commencement of Friday prayers. We entered the shrine just moments after the Muazzin said the Azan and to my astonishment I saw that here both men and women prayed side by side. There was no separation - the men stood on the left and the women on the right, but they prostrated themselves on the same carpet. Away from the prayers people placed money into Imam Khomeini's shrine and women and men sat on the marble floor and silently read passages from the Holy Qur'aan. Red and green lights strung up to celebrate Eid-ul-Fitr were being replaced by black flags in preparation for Muharram and the 50 or so people present arranged themselves so as not to disrupt the process. There were picnickers, enjoying a holiday out, and lamenters wailing and sobbing. A grandmother rubbed her palms on the pillars of the Imam's burial site and then vigorously rubbed them onto her grandson's head, whose orange Adidas winter headband slipped with every move of her hands. The 28th anniversary of the Revolution falls this February, but on this past Friday there was no place for celebrations. The weekend is Iran is over and Muharram is about to start. On Saturday, following a day spent in remembrance, these mourners and believers return to work and life in the city and an unusual calm descends upon these monuments dedicated to the country's past. About the author: Fatima Bhutto is a 24 year old Pakistani woman. She graduated with a Bachelor's degree in Middle Eastern and Asian Cultures and Languages from Columbia University and received a Masters at the School of Oriental and African Studies (SOAS) in South Asian Government and Politics. Fatima comes from a political background, her father Mir Murtaza Bhutto - an elected member of Pakistan's parliament - was assassinated by state police in 1996. His sister, Benazir Bhutto, was Prime Minister at the time of his killing. Fatima is the author of two books, a volume of poetry published when she was 15 years old in her father's memory a year after his death called 'Whispers of the Desert' and a collection of first hand survivor's accounts from the October 8, 2005 earthquake in Pakistan entitled 8:50 am. Both were published by Oxford University Press. The proceeds from '8:50 am' will be given back to child survivors of the quake. Fatima currently writes a weekly column for Pakistan's largest Urdu daily newspaper, Daily Jang, and its English sister paper, The News International. Her diary from Tehran is the second the papers printed; Fatima also wrote a weekly diary from Lebanon this past summer during the Israeli invasion.